I think we have reached an interesting crossroads in American culture. Causes abound for people to get behind some movement to create change for good. It almost seems popular now to join a cause or fight for others who may have it more difficult. Whether it is saving old buildings from being torn down by renovating them or making sure a service dog gets a proper retirement, there are GoFundMe pages for pretty much anything, and it is nearly impossible to scroll through your Facebook New Feed without seeing someone ranting about some problem or cause. It almost seems like our culture has taken a few positive steps ahead and is finally looking past ourselves and on to those whom we could serve, but I’m afraid it is merely a veneer, covering the reality of our current culture. Take this for example; there is currently a GoFundMe page for someone trying to save the lives of two pit bulls. What the page doesn’t explain is that those pit bulls (along with their owner) are being prosecuted right now because of an attack on a person and the dog they were walking. What seems good on the outside may not be exactly the story taking place. Or how about this? Last week in Seattle, according to Seattle Parks and Recreation, a man wearing board shorts entered the women’s locker room and took off his shirt. Women alerted staff, who told the man to leave, but he said “the law has changed and I have a right to be here.” “Really bizarre,” MaryAnne Sato said. “I can’t imagine why they would want to do that anyway!” Sato uses the locker room a few times a week, but she says this is a first for her. It’s also a first for Seattle Parks and Recreation. Employees report that the man made no verbal or physical attempt to identify as a woman, yet he still cited a new rule that allows bathroom choice based on gender identification (King5). This man has not been charged with a crime, and according to the report, has since done it again! This ought to give us good insight into the reality of where we are at today as Americans. The last few years have been spent trying to defend everyone and not make anyone feel uncomfortable (which is impossible, by the way), which is where this Seattle law came from – anyone can go into any restroom they want as long as they admit to identifying with that gender. Miss Sato even said she couldn’t believe that someone would use the law for their own desires, yet this is exactly where we are. As a nation, the outside actions may look like the choices people make are motivated by care, love, or some other kind of goodness (that, of course, depends on your personal point-of-view), but the reality is quite different. We have, as a nation, each become our own wolf in sheep’s clothing. Why? The problem of sin has hit an exponential growth rate in this latest generation. With the open acceptance of sin and the refusal to publicly call it sin anymore, independent sin issues have given way to corporate sin permission. Basically, whatever is evil is not called evil anymore and whatever is right is now considered evil. Guess what, friends, this isn’t the first time this has happened. Let’s pray that He light a pathway through these next few chapters to give us some insight into how we can live a Gospel-centered life and not only navigate the murky waters of our communities, but also be a source for good. 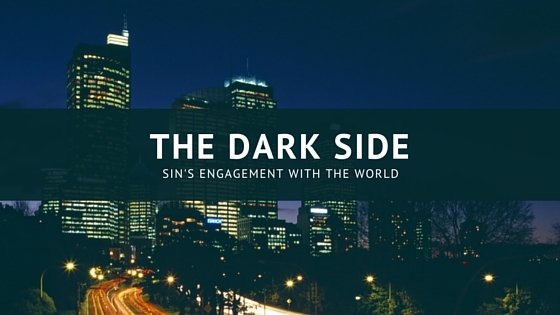 There are numerous other stories through these passages that could be looked at and referenced, such as the Nephilim, details on the flood, etc… but with this being an overview of sin’s engagement with the world, we don’t have time to go into all the details. You can read those on your own and see how they add to the exposition here. When we allow the Gospel into our lives through the saving grace of Jesus, the old has gone and the new has come. That slave ownership to sin is dead, but we have not yet been perfected and sin still wages its war in us. Paul described that very battle in Romans 7. It is a lot like this. Imagine a briefcase as my sin. Before I received the Gospel of Jesus, it was handcuffed to me and there was nothing I could do to put it down or get rid of it. It was shackled to me. Even when I wanted to do good or keep it at bay, the best I could do was hide it for a while. With Christ, he unlocks the handcuffs and frees us from the sin. It is no longer stuck to us, and its power to enslave is gone. We can, however, still pick it up and carry it along, yet all we need to do is put it down and focus on Jesus, the author and perfector of our faith. Sin is still right there and we can pick it up anytime we desire. This is why God’s offer/warning to Cain returns in Revelation 3:20; except this time it is directed to the church, to Christians, and it is Jesus knocking at the door. It becomes very easy as Christians, especially for those that have been following God for a long time and who have allowed Him to make changes in their life to become more like Jesus, to forget how close to sin we really are. No matter a person’s age or maturity level, that briefcase will still be right there, available for pick up. All you need is the right trigger at the right time. We are not that different from Cain, even as believers. We don’t get farther away from sin; we can become stronger against its advances, but don’t let yourself believe it’s not right around the corner waiting for you. It is this ultimate reality that leads God to question this quest; to test Himself and His resolution. Now the earth was corrupt in God’s sight, and the earth was filled with violence. And God saw the earth, and behold, it was corrupt, for all flesh had corrupted their way on the earth. And God said to Noah, “I have determined to make an end of all flesh, for the earth is filled with violence through them. Behold, I will destroy them with the earth. Allow me first here to make a specific note on a few theological items. First, we cannot look at God’s story using linear chronology. What this means is that, as we read the Bible starting from Genesis 1, it can look like God’s plan unfolded like this: Creation-Fall-Redemption. Simply put, that means that what happened is the way we read about it. God created the world, we messed it up, then He set about on a plan of redemption. However, from passages like Psalm 74:12-17, 1 Peter 1:18-20, Eph. 1:4 and others, God’s chronological order was Redemption-Creation-Fall. Basically it means that before the world was created, the Holy Trinity existed and knew they wanted to create humanity for the purpose of showing us how much He loves us. Jesus and the cross was the whole plan. That’s why He created the world. Second, God is allowing us to see in verses 5-8 a glimpse into His “person-hood”; His emotions. Our sin grieved God to a point where He actually felt betrayed by us and wondered if the love of those who would follow him was worth the pain caused by everyone else. Verse 8 teaches us a profound lesson – but for Noah. All it took to save humanity was the return love of one individual. God’s whole purpose is love, and it doesn’t take much to get Him to notice. We see this kind of response from God again in Genesis 18. What we are given through this story of the flood and even of Sodom and Gomorrah is God defining for us His views on justice and mercy. Verse 13 makes it clear that God does bring judgment down on the earth. Justice will be served; wrong-doing will be accounted for. However, that is not the end of the story. With the ark, God provides a remnant, a survivor and makes that survivor a promise – this will not happen again. Humanity will not be wiped away in one fell swoop. In the end, the sheep will be separated from the goats, but that is a different act. What God is saying to Noah is that God is merciful in His justice. That’s the key. God is saying that justice and mercy are not separate terms; they are one in the same. They cannot exist without each other; for justice without mercy is revenge and mercy without justice is enablement. True justice includes mercy. This becomes clearer at the end of the flood. Noah is that mercy in the justice of the flood. This is the precedent that God is setting when He promises not to flood the earth again; no hasty decisions, no surprises. Each person will one day have to face God and account for their life; but His mercy is offered by way of a pardon in the person of Jesus. His mercy is time – patience. I can’t tell you how many blog posts I have read talking about the world today that end in “Come quickly, Lord Jesus”, and yes, I am all for that, but the reason that evil still exists in the world is purely a result of His mercy! See what Peter says here: “The Lord is not slow to fulfill his promise as some count slowness, but is patient toward you, not wishing that any should perish, but that all should reach repentance” (2 Peter 3:9). God has allowed time to unfold and His return to be stayed not because He is off doing something else or doesn’t care anymore, but because He does! The longer He delays the more people have a chance to repent! If you all knew that in 1 hour the world would end and you would be in front of God, how different would that last hour be compared to the previous 23? Instead of being weary of the world around us and begging for His return, shouldn’t we take advantage of His patient mercy and make sure everybody has the opportunity we’ve had? We are given a chance to be a force for good in this world. The Gospel in us, the hope of salvation and the only source for change is in us. God is holding back His return to give us time to share and others time to respond. The problem of evil in our world today is a gift of His merciful justice! No one is escaping punishment, but we are all given the chance to have our debts paid by Jesus. Yet the Gospel is even more than that; it is the power in us to make us Holy and strengthen us against sin. Regardless, sin never strays far from us. Christian or not, it is still crouching at the door, waiting for an open opportunity to strike. It is weakened, in that once we choose Christ, it cannot re-enslave us, even though it can distract us. Those who are honest with themselves know all too well that sin can creep up anytime. Notice that sin did not die with the flood. As soon as the covenant with the rainbow was in place, Noah got drunk and Ham fell into corruption and gossip. Evil still exists; it is still there in you and won’t be fully gone until the day of perfection in Christ Jesus – the day you see Him face to face. What we Christians have today is a choice. We have options – we can pick that sin up if we want and will most likely have some earthly consequences to deal with; or we can go step by step and day by day, giving our life over to God and being asked to be filled by His Spirit. We can choose to do good, not for earthly reward, but to please our Lord and build up treasures in heaven. Engage Sin or Engage God? We can choose to be angry and disconnect from the world around us, or we can choose God’s pathway – to engage with the people around us and, through patience and mercy, stand up for God and show others the way to freedom. How does that look in our lives? We need to stop hating and ranting against what we don’t like and focus on solutions. Here is an example – I saw a Facebook meme recently that posed an interesting question. “If you call yourself pro-life, what are you doing for the orphans and homeless?” It can be so easy to take up the cause against abortion and fight to make it illegal again; yet being pro-life is much bigger than that, isn’t it? Jesus showed us the power of human touch and love through His miracles – how many lives have you touched lately? Many people have asked me how I can be a foster parent – they say that the fear of a child being taken away from them is just not something they can face. I agree with them – that is a terrible feeling, but that’s not the right way to look at foster care. People shouldn’t be afraid of a child being removed from their care, but of the countless children in southwest Florida alone that are going without love, food and care tonight. This is just one way to engage with the world and there are many angles on which to fight for Jesus through love and mercy. But the challenge today is simple: you need to be careful, because as God said to Cain, sin is crouching at your door, especially if you are not engaging with God. God engaged with us when the whole world was at its most corrupted and defined true justice. He has chosen to make us His representatives today. I think there is a direct correlation between our passionate activity following God and the strength sin has to distract us. It will always be there, it will always try, but if we don’t have time for it because we giving all of our time to the Gospel, then there won’t be as many chances to pick it back up. What do you need to put in your life today that will help you stay strong against sin and be God’s mercy in the world?